Chuck's Chatter: The Hubris of Physics? Those who study physics as a discipline in its own right must confront the reality that it is essentially impossible to be a master at all parts of physics. The people who study fluid dynamics, or electromagnetics, or quantum mechanics, or astrophysics, or relativity, or any of many other disciplines that all fit under the umbrella of physics must realize that they simply can't be a master of all these very diverse subdiscipines. My field, meteorology could be considered a subdiscipline within physics, but meteorology itself has fractionated into many diverse sub-subdisciplines: atmospheric chemistry, atmospheric dynamics, high-atmosphere physics, boundary-layer meteorology, physical meteorology (the study of optical, electrical, acoustical, and thermodynamic phenomena in the atmosphere, including the physics of clouds and precipitation), severe storms meteorology, tropical meteorology, remote sensing, etc. Again, no meteorologist is master of all these. Why do I belabor what might seem to be an obvious point? Science is growing so fast that no one could possibly become a world-class expert in all its facets. Surely everyone already knows that. Yet I've seen several recent examples of scientific papers published by those who call themselves "physicists" who are attempting to say something original and innovative about the meteorology of tornadoes. In virtually all the examples I've seen, the physicists are displaying embarrassingly profound ignorance of the science of meteorology. What qualifies them to publish such "research"? When I talk to students about their progression from undergraduate, to graduate school - first for a Master's degree, and then for a Ph. D. - one thing that I emphasize is that if you're going to do original, innovative research in some area, it takes considerable time to build up an appreciation for what's been done already in that area, and to learn what problems are still in need of solutions. The trick for a piece of research is to know what problems are simultaneously interesting and important, as well as being solvable. It's relatively easy to find interesting problems, but many are unsolvable, barring some as yet unknown breakthrough. Solvable problems are not always worth the effort because they're not very important. The "dilettante" physicists of which I'm writing seem content to bypass all that, perhaps because they've concluded that their physics academic credentials qualify them as experts on whatever they choose. The "Horatio Alger" story about the outsider who comes in knowing nothing and so is unshackled by "conventional" thinking and thereby able to see things that specialists can't see is widely popular, but the reality is that the vast majority of such efforts by "science carpetbaggers" are failures. Alfred Wegener is probably one of the very few exceptions to this, and he was a meteorologist speculating about geology - at least it was another Earth science! 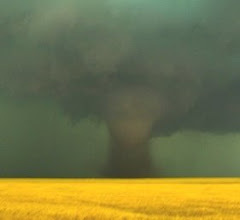 A few of these "outsider" papers about tornadoes manage to get published in scientific journals, but virtually never in meteorological journals, where the reviewers would pick them to pieces. None of them, to my knowledge, ever have contributed anything at all useful. Just because physics likes to consider itself the "Father of the Sciences" doesn't mean that a physicist knows much about, say, meteorology. I've known a few physicists personally, and while I certainly can't generalize about all physicists, I've seen the sort of disdain some physicists have for "lesser" sciences, evidently thinking they're child's play compared to physics. This sort of arrogance is not merited by reality. Many sciences have their own emergent concepts that might be based ultimately on physical principles, but which represent a specialized domain of knowledge that isn't so easily understood, even by physics majors! In general, nothing about a physics education prepares one to leap into some other science and claim to have a deep insight not shared by the scientists in a "lesser" science. In the cases with which I can claim some familiarity, the ignorance of their assumptions about meteorological topics is the dominant flaw in their papers. All of us need to be respectful of the work of others in comparison to our own. We may have issues about that work or the conclusions drawn from it, but we should never disrespect others simply because we perceive our discipline is more challenging and our understanding more comprehensive and, therefore, we are more deserving of respect. Amen!! This content of this particular post has needed stating out loud for quite a while. Thanks for taking the initiative. Nobody cares about your whiney excuse for failing to look outside your comfort zone. I honestly feel bad for both you and Paul because when the full story breaks it's hard to imagine it not being embarrassing for both of you. BTW, for what it's worth, embarrassing either of you is not my intended goal. It's just a means to an end. So when you two bozos get done wallowing in your self-righteous indignation I will need both of you on my team to present this to congress. What you've seen so far you have been able to easily ignore. That won't be the case much longer. The Horatio Alger of Meteorology. I'm allowing your post, despite the fact that your "solution" is virtually certain to be pure nonsense. I'll await results of your "full story" when it breaks. However, don't bother responding further because I won't accept any more from you - until you show everyone solid confirmation for your idea to "solve" tornadoes. I found your paper when I GOOGLED hubris physicist. I recently watched a "debate" on the web, Intelligence Squared, where Lawrence Krauss displayed the hubris you described to a tee. His arguments and claim to ultimate rationality/truth were filled with basis flaws so profound that I marveled how he could make it so far. Neil deGrasse Tyson is another science actor who seems to fall victim to the maxim: bad logic leads to bad philosophy which leads to bad theology. We tend to give Stephen Hawking a pass due to his ALS, but in reality the other ‘rock stars of science’ seem to walk and talk and pontificate under his umbrella and therefore act as "kings of the hill" with a force field of ultimate trumpism that protects their position of suggestive power over both physics and metaphysics. Albert Einstein started this trend but he was no atheist. Scientism is not scientific. I can't speak to whatever "basis [sic] flaws Lawrence Krauss might have made, but your comments are rather off the track of my post. You seem to be taking an anti-atheist position here and I agree wholeheartedly with Neil deGrasse Tyson's atheism (not "theology"). Einstein was an atheist but didn't like the baggage that went with the label. As for scientism, the only point of view that is dogmatic and filled with certainty is religion, not science, and not scientists like those you mention.